Ready to contribute code? Here’s what you need to know to get your Pull Request accepted. In the past, we used to have only one commit by pull request. This was a bad habit. We now require contributors to make atomic commits, so you will surely have more than one commit in a single pull request. This will be helpful to review, cherry-pick or revert changes (we hope to never have to do that 😉). What’s an atomic commit? It means that the commit’s purpose is one, and only one, complete fix or change. Typically, ask yourself if what you are doing is one or several tasks. Do not hesitate to use git add -p ... (details here) if you have made several changes in the same file but not all those changes are meant to be in the current commit. and S is the number of segments. Compile assets for production. Check that that the assets you are compiled were built using the “prod” setting instead of the “dev” one. To find out more, read How to compile assets. Commit assets and sources separately. Submit your compiled assets in a separate commit from your source changes. This will be especially helpful when rebasing, because you can just drop the commit and avoid merge conflicts. One asset commit per Pull Request. Try to avoid recompiling and committing the assets more than once. If you need to make changes and you have already committed a previous build, use interactive rebase to remove the previous commit, then compile the assets. Now that you have made atomic commits, you surely have a lot of commits for one pull request. A pull request should answer to a single given issue. Do not ever make a single pull request for many purposes. Do not hesitate to split your big commit into several subprojects. It will be easier and quicker to review. As all your commits messages are well-formatted, just make a summary of your pull request’s purpose in its GitHub title. A summary does not mean it can not be explicit. Please describe what your pull request does in detail (avoid “Fix product page” or “Category page improvement”). Then, just fill the PR template table to answer some questions which will help the team make a decision faster. Please note that all the pull requests must follow those guidelines. If the commit messages are not well-formatted, the pull request’s title is not correct, or the table is not properly filled, we will not be able to accept your pull request. However, reviewing code is hard and can be exhausting. Making your pull request as easy as possible to review will help in getting it accepted swiftly. Completing the pull request form (explained below), properly explaining the reasons behind some of your technical choices, as well as any part of the code that could be tricky to understand… those are some examples of things that you can do to help ease up the process. Also, please avoid submitting very large PRs when it can be avoided. If you modified a lot of files or a very big number of lines, it is unlikely that you’re addressing a single issue: please try and submit one PR for each issue you solve. This way, a problem in one change won’t block other valid changes from being merged. A PR with a lot of changed lines will take a long time to review, and consequently the reviewer might miss possible issues. If your PR is too big, it may be rejected due to risk of regressions. Remember: smaller changes are easier to review, easier to test and easier to merge. Pull requests must be made in the appropriate branch, depending on the nature of your change. Develop. New features, bug fixes, improvements. PRs merged here will be released in the next minor or major version. Patch version branch (eg. 1.7.4.x). For critical bug fixes and regressions only. PRs merged here will be released in a patch version. 1.6.1.x branch. 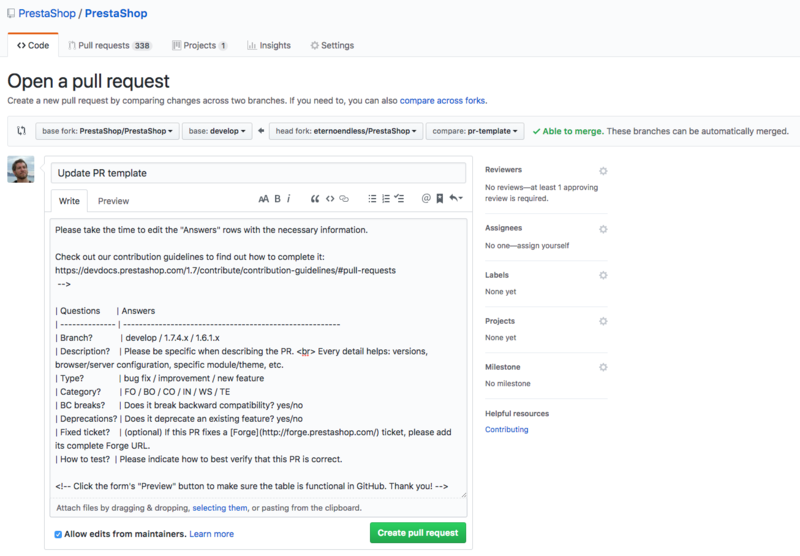 For PrestaShop 1.6 bug fixes only. PrestaShop only accepts PRs on branches which are subject to new releases. Once PrestaShop releases a new minor (“dot-zero”) version, it won’t release new patch versions for previous minor versions – with the exception of rare cases, for example if a security bug is found just before or after a minor release is published. This means that except for 1.6.1.x (on extended support), only the latest minor version patch branch is supported. For example, the 1.7.4.x branch is supported until the release of version 1.7.5.0. After that, the only supported version branch will be 1.7.5.x, and so on. If you find a bug on an unsupported version, make sure that bug is still present in the latest version. If the bug is still present, please submit a PR on develop. PRs on unsupported versions will be closed. When in doubt, use the develop branch. We will ask you to rebase on the correct branch if necessary. Remember, this is only needed for the Pull Request form, not for your commit messages.